I spent yesterday in a deep dark corner of the Hampshire countryside - visiting my Mum; family anniversary - where only the woo of an owl might keep you from sleep - and, where the internet dare not reach. Still, as far as I could judge from Ceefax, I didn't miss much in game 3 of Kramnik's contest with both Deep Fritz and his own blunder-loving demons. But in fact, playing through the moves of the game - 1.d4 Nf6 2.c4 e6 3.g3 d5 4.Bg2 dxc4 5.Qa4+ Nbd7 6.Qxc4 a6 7.Qc2 c5 8.Nf3 b6 9.Ne5 Nd5 10.Nc3 Bb7 11.Nxd5 Bxd5 12.Bxd5 exd5 13.0-0 Nxe5 14.dxe5 Qc8 15.Rd1 Qe6 16.Qd3 Be7 17.Qxd5 Rd8 18.Qb3 Rxd1+ 19.Qxd1 0-0 20.Qb3 c4 21.Qc3 f6 22.b3 Rc8 23.Bb2 b5 24.Qe3 fxe5 25.bxc4 Rxc4 26.Bxe5 h6 27.Rd1 Rc2 28.Qb3 Qxb3 29.axb3 Rxe2 30.Bd6 Bf6 31.Bc5 a5 32.Bd4 Be7 33.Bc3 a4 34.bxa4 bxa4 35.Rd7 Bf8 36.Rd8 Kf7 37.Ra8 a3 38.Rxf8+ Kxf8 39.Bb4+ Kf7 40.Bxa3 Ra2 41.Bc5 g6 42.h4 Kf6 43.Be3 h5 44.Kg2 ½-½ - that is not quite the case. Fritz had some pressure for a pawn, and then Kramnik found a neat way to liquidize to a drawn fortress endgame. Chessabit are a new London outfit, who are about to run their second one-day rapid-play tournament. The event is this Saturday - December 2nd 2006 - in East London. First prize is £500, no less - and best of all, it's not to late to enter. Click the link above for more details. I took part in their first event over the summer, and I was lucky enough to scrape my way to second place and a prize of £250 - plus a few goodies thrown in from their sponsor. It was a nicely organised event in a novel setting (that time, the Salvador & Amanda bar/club/restaurant in central London.) I'm sure they will have learnt a lot from it too - especially how to deal with cantankerous old timers - and so this next event promises to be even better. The diagram position is taken from one of my wins that day, and should tell you something about the standard of play required in this kind of tournament. That is, the standard required when the time-limit is all your moves in fifteen minutes, and the grading limit is 175ECF and under. Black, my opponent, was to move, and he tempted me with 1. ... f6. I decided upon: 2. Nxg6 hxg6 3. Qxg6 White's attack doesn't make that much sense - and 2. Nf3, 2. Bxg6 and 3. Bxg6 were all probably better choices - but real precision is required to defend here, and thus I reasonned the position would gain me 'five minutes of compensation from the clock.' In fact, I got even more from it. After 3. ... Kf8 4. h4 Bf7 5. Qh7 Ne6?? 6. Bf5 Bg8 we reached the second diagram position, below. I just had to spot one of those tactics that are key in blitz, and I'm sure you'll spot it too. Yep - after 7. Qxg8+! Kxg8 8. Bxe6+ Qxe6 9. 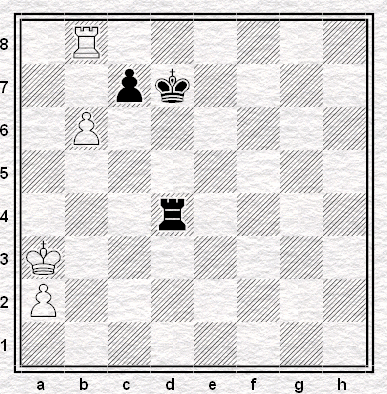 Rxe6, the endgame was easily winning for white. Hope to see you Saturday. It’s humankind against the computers and frankly we’ve embarrassed ourselves. [see Shock and Stun below]. There goes Kramnik, allegedly the very best we’ve got to offer, making the sort of howler that would shame a patzer who spends his time fiddling around the lower reaches of the London League. A player such as myself I mean. Perhaps we shouldn’t be too surprised. 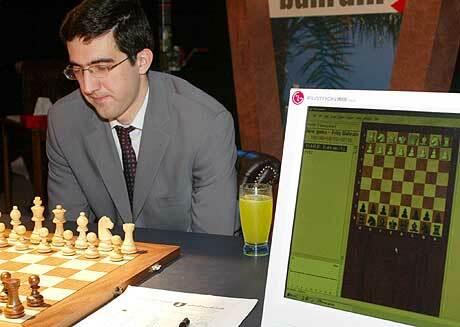 After all Kramnik’s recent match against Topalov was settled by a rank bad move. We probably should have seen that coming too. Looking back at World Championship matches, you'll find both Champions and Challengers committing blunders of true beginner-level brilliancy. Yes, from Steinitz-Zukertort all the way to Kramnik-Topalov, it seems the greats not only outshine us amateurs in matters of conventional chess technique, but that they also horlicks things up with a lot more style too. This is definitely an area that warrants further investigation but before we start our quest to find the greatest World Championship Blunder of all time we need some objective criteria by which we can judge the contenders. After long contemplation (while I was on the bus on my way to Golden Lane last week) using the latest technology (back of envelope, biro) I’ve discovered each blunder can be definitively rated using four criteria. The first two categories probably speak for themselves. A move that turns a certain win into a dead loss during a closely fought match should clearly score more highly than one that merely transforms an easy draw into a slightly worse game when the match situation is already beyond saving. The other categories, though, may need more explanation. My robust and absolutely non-subjective (ahem) yardstick for *Degree of Difficulty* is how I'd feel if I played the move myself during a routine London League match. *Artistic Merit*, on the other hand, is a collection of sundry factors that the truly gifted will throw into the mix to lift his work above the mediocre. It’s a dollop of cream that might (slightly) disguise the stench of rotting strawberries if you will. It’s a concept, I must confess, I struggled to explain to Tom when we discussed the potential for this series. Some potential examples are the blunder requires a Queen sacrifice to exploit or perhaps the move itself was so wonderfully pointless it’s really difficult to work out why it was played even if it didn’t lose instantly. That sort of thing. 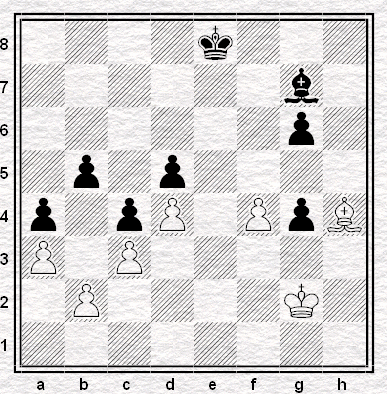 if Black now takes the Rook White will Queen so it's Good Night Charlie. Topalov was losing anyway in a blitz finish you never can be quite sure so you have to say blowing the game instantly had a fairly significant effect on the game. Similarly it was effectively a world championship decider so losing the game meant automatically losing the match. Of course it was just a rank bad move and thus fairly hard to find in normal play. I'm not sure what I would have played in the position myself, perhaps trying to get the Bishop around to have some influence on the Queenside, but I'd certainly be kicking myself after the game if I'd come up with ... Rc5. In terms of Artistic Merit there really isn't much to say. A simple one move refutation and that's your lot. I do find it somewhat amusing that Topalov should lose the match in this way, given his (some would say) questionable behaviour earlier in the contest. There's nothing too memorable about this blunder though, more's the pity. So there you have it. Topalov manages an Ultimate Blunder Rating of just 8/20. It's respectable, but not really good enough at this level. Trust me, there are much better of examples of ineptitude to be found in World Championship matches across the years - something I hope to demonstrate in the weeks and months to come. Next time ... probably the most famous World Championship blunder of them all. Susan Polgar is regularly stunned and shocked when it comes to chess events and moves - but even she might have to reach for the thesaurus to express her amazement at this one. 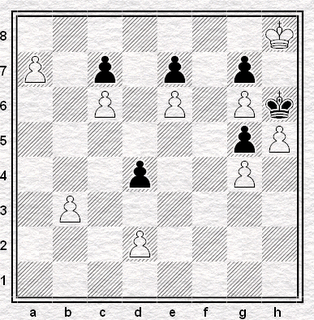 In the diagram position it's black, Kramnik, to move, in game 2 of his match against Fritz from today. Now it doesn't matter how centralised you are, whether you'll be better in the endgame after a queen exchange, nor whether your bishop is better than the knight, or how quick you can make a passed pawn - not when your opponent threatens mate in one. The second game of the man versus machine contest from Bonn, Germany, starts in just over half an hour. 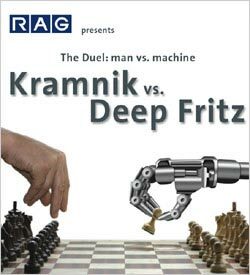 Kramnik will play black - and so, one might imagine, his chances of exchanging straight out the opening into the kind of technical endgame at which he excels - and where Fritz might encounter serious problems - are probably rather less than in Game One. Especially if Fritz opens 1. d4. ChessBase - who manufacture Fritz - have been covering the event like crazy. Their top five stories are all currently about it. Aside from Yasser Seirawan's analysis (which I linked to from the post about game one) these excerpts translated from a Kramnik interview in German were particularly interesting. You might think nothing else was happening in the chess world - but that's not entirely true. Check out the excellent news service Doggers Schaak to find out how Loek van Wely won a horse, or how Ivanchuk is getting on in Cuba right now, for instance. This is Adam W's adjournment position from the Streatham & Brixton Chess Club First Team match against Ilford (which was left 5-3 with four adjournments on the night). 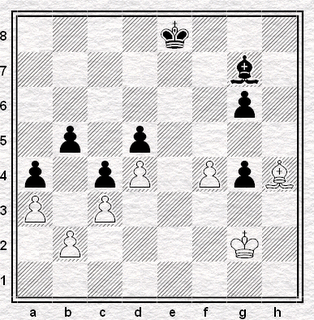 His opponent, who had the black pieces, sealed, and below the diagram you can find out what happened on the resumption. The sealed move was 37. ...Qg5 - but after 38. Rh4+, black blundered straight away with 39. ... Qh5?? Necessary instead was 39. ... Qxh4 40. Qxh4+ Kg7. Then, whilst white doesn't have any immediate mating threats, he can still round up the d6 pawn with Qd4+ and Nb5 - after which he can advance his c-pawn, and maybe at the same time apply pressure on the black kingside with h4-h5. But what happened allowed Adam to finish the game off in crisp style. 39. Rxh5+ Kxh5 40. Nd5 Rde8 41. g4+! The key move. Black's king is caught in a mating net. 41. ... Kh6 42. g5+ Kh5 43. Qf3+ Kxg5 44. Qf4+, and black resigned. It's mate next move. Jeremy meanwhile agreed his adjourned rook and pawn endgame as drawn - which brings the match score to 5½-4½ in Ilford's favour. Good luck to Angus and Alan in their adjournments - the results of which will decide the match, one way or another . . .
"This computing monster keeps getting better year by year, month by month, day by day: My opponent will be incredibly strong. But I think I can still beat it." Of course, there'll be live coverage all over the internet and chess servers. I'll be watching it here - whilst Chessgames's coverage might (who knows?) offer a more sophisticated level of kibitzing, compared to the usual in-jokes and chatter on the ICC & Playchess. Apart from that, you can find out more about Kramnik from his home-page, whilst the official site for the match is here. I'll post the moves of the game up once it's done. And so - it was a draw. Streatham & Brixton Chess Club blog goes fully public today. Please take a look around - you'll find team and tournament reports, for instance, as well as puzzles to baffle and amuse. There's a happy birthday to Capablanca, and a link to an excellent free book, and more besides. Or you can just clik the 'November 2006' archive link up on the left, then scroll about to take a look at it all for yourself. And if you're done with all that - then feel free to leave a comment, or try out the sidebar to the left, which is bursting with chess links. Mm, what else do you need to know? Well - we plan to update the blog at least once a day, with anything from club news to trivia, puzzles to opinions, games to history. Oh, and let me know what you think. New In Chess frequently send me adverts for products I can't afford, but this morning's credit-card temptation took me by surprise. "Botvinnik's Secret Games is about the training matches which the Patriarch played to prepare for his World Championship contests," writes Allard Hoogland. "It contains no less than 97 games from between 1937 and 1970, many of which are annotated by Timman." Can't you just print that for free from the internet, though, a corner of my memory asked . . . ? Not quite, it turns out . . . The book also has an amazing chapter by Yuri Averbakh, one of Botvinnik's training opponents. 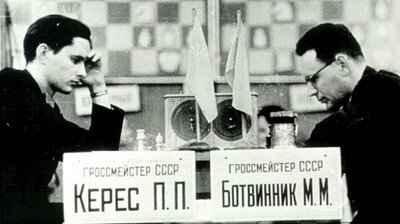 Averbakh relates how he had to play in front of a blaring radio because Botvinnik wanted to steel his nerves against noisy disturbances. "After five hours of play", writes Averbakh, "I felt like an utter zombie." I always feel like an utter zombie after five hours of play, but team-mates from our club will know that already. Anyway - if I were you, Streatham & Brixton Chess Club, I'd download the free version now, in case it disappears like a secret. 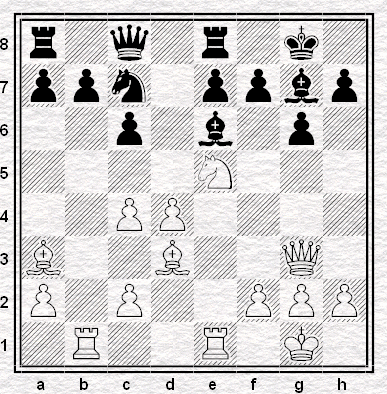 What's the most extraordinary move you've ever played? That you've seen played? That's ever been played? Unfortunately, my answer to the first question is my 35. ... Re3 from a recent London League match for Streatham & Brixton Chess Club first team - overlooking the none too subtle reply 36. Rf3xe3. A whole rook down I went - and no, I wasn't in time trouble either. This position is from Gomes - Neto, Rio de Janeiro 1942. Black played an extraordinary move too, but extraordinary for all the right reasons. Can you spot it? It's number 108 in Tim Krabbé's 110 Most Fantastic Moves Ever Played - but one of my favourites. Bytheway, you can find a link to Tim's site in the sidebar. On which note - let me know if you think I've left any interesting chess links out from there, and I'll add them too. The Third Civil Service Open Chess Congress took place on the weekend of the 11th November, at the London School of Hygiene and Tropical Medicine. Three Streatham & Brixton Chess Club players took part. Barry battled it out in a tough-looking Major - whilst after a nice win in the first round of the Open, I managed only one draw from the next four games. Well done to Robin though who had a much better time of it - scoring 3/5, which proved enough to win him a cut of the Grading Prize. The Civil Service Chess League site currently has a brief summary of the tournament - whilst if you want to look through any of the games from the Open, they are available here (via the BritBase site) although many seem incomplete. Upcoming tournaments meanwhile can be found listed here. Well, they say nothing was working in London this morning. No Central Line, no Circle Line. Delays on the Northern and Picadilly. Strikes on the buses. The night's engineering work on the train tracks not finished on time. Silent thousands fuming on the platforms. Glad I slept right through my alarm and missed it all, frankly. I don't know anything about this puzzle, except it's called "Scenic Railway." If only London worked so prettily too. Streatham & Brixton Chess Club entered a second team for the first time last year in the London League. That team topped the Fourth Division by one game point, and was thus rewarded with promotion to Division Three - a somewhat tougher prospect. So far this year, the team has played three matches. Despite a close 4½-5½ defeat at the hands of Capablanca, we beat West London 7-3, and overcame East Ham by the narrowest of margins - 5½-4½. Incidentally, that extra half point was earned by Alan in a tricky adjournment where he defended tenaciously for over two hours - great stuff. The second team's next encounter is at Golden Lane on the 23rd November against Albany. Albany have won both their mathces so far this season, and look to have a strong line-up - as can be seen by the London League Division 3 table, here. We can compare Capablanca with Mozart, whose charming music appeared to have been a smooth flow. I get the impression that Capablanca did not even know why he preferred this or that move, he just moved the pieces with his hand. If he had worked a lot on chess, he might have played worse because he would have started to try to comprehend things. But Capablanca did not have to comprehend anything, he just had to move the pieces! Well, at least I have a lack of comprehension in common with Capablanca. Anyhow, wikipedia has a brief article about him here, whilst below is a short and spectacular crowd-pleasing win of his, against the amateur Jaime Baca Arus in an Exhibition Match in Havana, 1912. 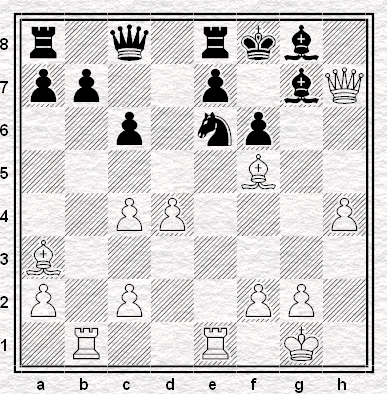 Capablanca played white. See if you can spot the continuation from the diagram position. I should let you know at this point that Capablanca was playing blindfolded. But can you see his next move? 14. Nc4 dxc4 15. Bxc4+ Nhf7 16. Rxd6 Qxd6 17. Nxe5 Be6 18. Rd1 Qe7 19. Rd7 Bxd7 20. Nxd7 Rfc8 21. Qc3 Rxc4 22. bxc4. 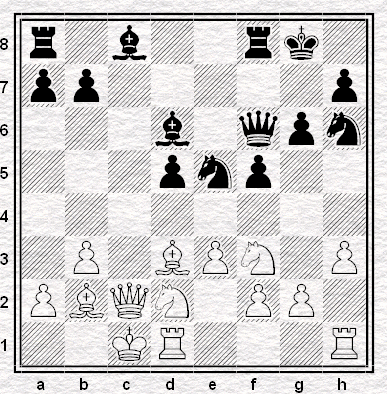 Some sources say black resigned here, whilst others give these concluding moves: 22. ... Nd6 23.Qh8+ Kf7 24.Ne5+ Ke6 25.Qxa8. Either way, white won. Anyhow - Happy Birthday Capablanca, from Streatham & Brixton Chess Club! Rook and pawn endgames are notoriously tricky - which means that in practice, they're notoriously drawn. 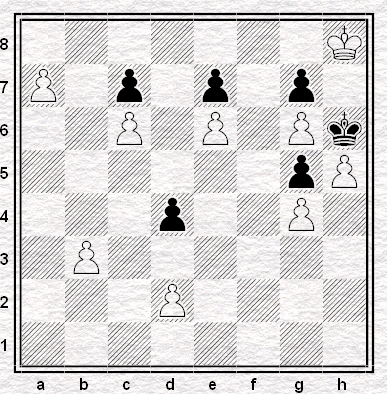 This particular position indeed looks rather tricky for white (to move) to win, as both 1. b7 and 1. Rb7 can apparently be met by 1. ... Kc6. But white has something crafty up his sleeve. Can you spot it? Despite a 2.5 - 9.5 defeat in the opening London League Division One match of the season at the hands of last year's Champions Wood Green, Streatham & Brixton Chess Club First Team bounced back in our second match, beating the ever-hospitable Drunken Knights 8-4. The next test was on November the 15th against Ilford. That match is currently poised 5-3 to them - with four adjournments waiting to be played out. 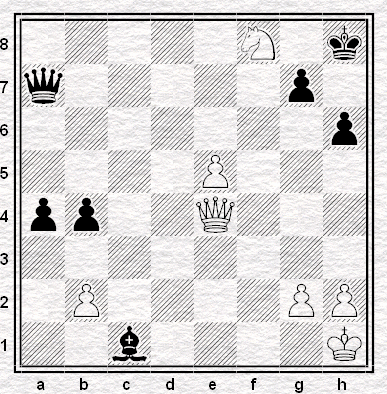 Here's my win from the evening, where I played white on board 8 against David Chandler. 1. e4 e6 2. d4 c5 3. Nf3 cxd4 4. Nxd4 a6 5. Bd3 Nc6 6. Nxc6 dxc6 7. O-O e5 White has a slight advantage - a tiny lead in development, and a few holes in the black queenside to aim his pieces at. 8. Be3 Nf6 9. f3 Bb4!? 10. Qe2 Qe7 11. Nd2 Be6 12. Nc4 Bxc4 13. Bxc4 Rd8 14. Qf2 b5 15. Be2 Qe6 Black has played inaccurately, and now will have to make one kind of concrete compromise or another on the queenside. 16. a4 O-O 17. c4 bxc4 18. Rfc1 a5?! (18. ... Rd3! was the best way to confuse matters.) 19. Bxc4 Qd7 20. Rc2 Rb8 21. Rac1 h6 22. Bf1 Rfc8 23. Ba6 Rd8 24. Rxc6 Ra8 25. Bb5 Rab8 26. Bb6 Rf8 27. Rxf6 Qd2 28. Rfc6 Over the last eight or so moves, black has been playing for traps rather than sitting back and suffering a long defence. He was short of time and perhaps intended 28. ... Rxb6 - but that loses to 29. Qxb6. Black resigned. Croydon League Second Division - First Result! The Streatham & Brixton Chess Club Second Team played their first match of the new season on the 15th November, in the Croydon League second division. An exciting match ended in a 2-2 draw, with Jonathan and Alexey both winning. 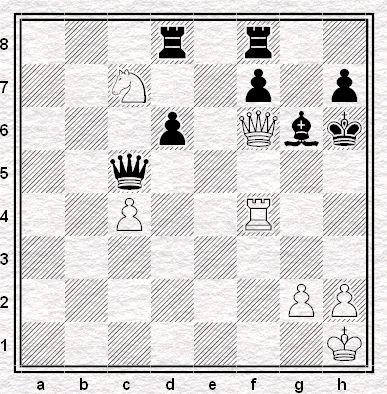 White had been pushing in the middlegame, and is still trying to win this endgame. 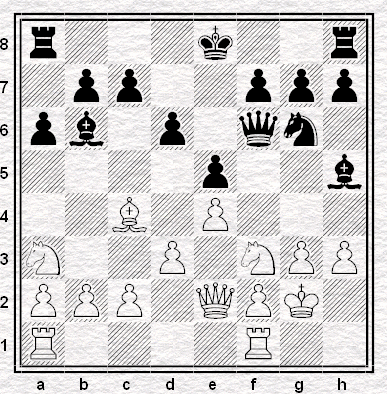 With his last move (1. 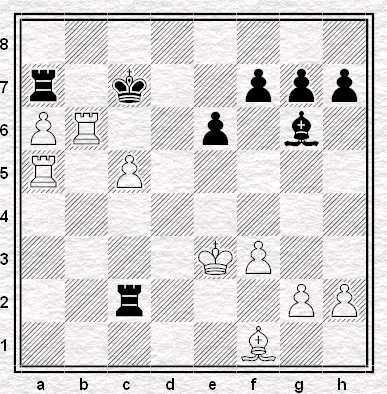 Bf2-h4) he intends Kg3xg4, and then to penetrate via f5 or g5. Black can stop this by posting his bishop on h6 and king on e6, and then by meeting Bg5 by retreating his bishop - with a definite draw. Or does he have something better? It's the news the chess world has been waiting for. No - not that Fischer has returned, and will face an unretired Kasparov, in an unlimited match. No - not that The Master Game is back on BBC2. No - not that Hydra has created a 32-piece tablebase that proves once and for all that 1. g4 wins outright, whilst everything else is a draw. No - it's not the low-down of what Kramnik was doing in his toilet after all. No - Wood Green have not lost a London League match. Yes, that's right! We - Streatham & Brixton Chess Club - have gotten ourselves a new blog! Although thinking about it, you new that already, since you're looking at it.